﻿Emma Metcalfe designs and illustrates bespoke hand drawn maps which are perfect for museums, castles, visitor attractions and publishers. Emma provides a full creative service, working with you to create beautifully illustrated bespoke maps which meet your requirements perfectly. Whether you require an orientation map to help visitors find their way around, or a lively trail map to appeal to children, Emma would be happy to discuss your project. ​Emma provides a tailor-made service: all maps are hand drawn, with professional quality artwork. 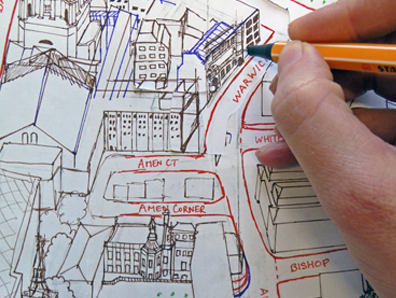 Maps are coloured using pencils, watercolours and/or digital colour. ​Emma can design a bespoke map to your specific requirements, such as maps for signage, guidebooks, publishing, local town maps, heritage walk maps, festival maps, local area maps, city maps, souvenir maps, decorative maps, garden maps, wildlife park maps and even treasure maps! ​Emma has recently illustrated bespoke tourism maps, editorial maps to accompany magazine articles and even maps of whisky distilleries! ​Contact Emma for an informal chat about your map requirements. Emma offers professional quality artwork, meticulous attention to detail and a friendly down-to-earth service. ​ ​All from a trusted heritage sector specialist.